Managing director and founder of PR Worx, as well as Status Reputation Management Consultancy, Madelain Roscher has been awarded the Africa Women Leadership Award by the World Women Leadership Congress and Awards. "I am honoured to have been awarded such a prestigious accolade. To be acknowledged for the work I am doing within the communications sector and political space as a female African leader is indeed a humbling experience," says Roscher. The Women Leadership Awards was hosted and presented by CMO Asia to globally honour women who achieve excellence in displaying leadership in their respective fields of business. The awards seek to celebrate female leadership in several geographic regions as part of their build-up towards the World Women Leadership Congress. The event, held in Sandton, aimed to acknowledge some of the continent’s female leaders and achievers in organisations who, in turn, believe in producing leaders in their respective fields. This includes leaders of change, leaders who are iconic and leaders who committed to driving a talent management strategy alliance within the vision and the mission of the company. "Understanding how stringent the judging process was makes me even more appreciative to have been recognised in this manner. To be recognised for my commitment to impacting the continent as a whole is indeed a great honour," adds Roscher. 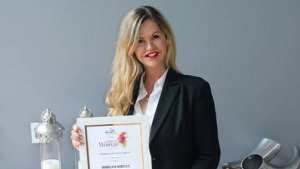 In March, Roscher’s firm, PR Worx, was awarded the PMR Africa Award in the Best Public Relations category for the ninth consecutive year, bringing the total number of awards the company and its managing director have won in 17 years to 43 awards. "I never entered this industry for the recognition or the awards. I do what I do because I am passionate about making a real and remarkable difference in Africa, which makes winning these types of accolades all the sweeter. I truly believe that as long as you remain true to yourself and are willing to put in 150% in all that you do, you will always yield positive results," Roscher concludes. For more information, visit www.prworx.co.za. You can also follow PR Worx on Facebook or on Twitter.